Obesity has reached alarminq rates around the world. The need for concrete and effective prevention strategies to counteract overweight and obesity is now considered to be urgent, especially with regards to children. To tackle such a multifactoriol issue, obesity prevention strategies require a holistic approach and the participation of actors from all sectors to work in concert at all levels and to propose solutions that are evidence-based, sustainable and transferable on a large scale. The EPODE (Together Let's Prevent Childhood Obesity) methodology, and its adaptation into several programmes in Europe and beyond, combines these key elements. 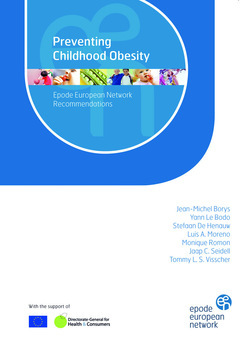 Emerging from the pillars of this methodology, the EPODE European Network (EEN) project is a collaborative and multidisciplinary initiative, whose objectives have been to develop and disseminate recommendations for the implementation of community-based interventions aimed at preventing childhood obesity. Supported by the European Commission (DG SANCO), the EEN has gathered multiple contributions from institutions, academia, national and local authorities, public health experts and professionals, civil Society organisations, private stakeholders and industrial partners. This book of recommendations is the result of a collaborative effort from the combined research, dialogue, experience-sharing and consultation activities implemented between 2008 and 2011.